One of the great things about basketball is that there are so many ways to score. 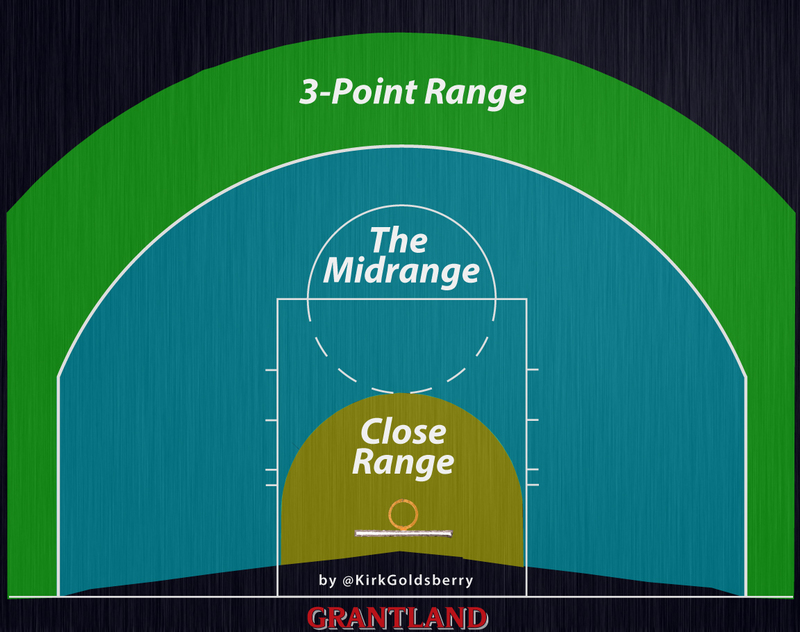 Through the lens of scoring ability, NBA players are like snowflakes — they’re all different. Kyle Korver, Dirk Nowitzki, and DeAndre Jordan are each really effective, but they achieve that effectiveness in vastly different ways. Jordan is unstoppable near the rim, Nowitzki is a step-back monster in the midrange, and Korver is a catch-and-shoot freak beyond the arc. However, the game’s best scorers are not one-trick ponies; they can finish at the rim, hit midrange jumpers, and also drain long 3-pointers. But only 22 of these 111 players were converting those shots at above-average rates in each of the three regions. In other words, there are 22 guys in the league who effectively blend volume and above-average efficiency in the paint, midrange, and beyond the arc. Most of these players are sharpshooting guards or wings who can also finish near the basket, but then there’s the one outlying 6-foot-10 dude who also ranks second in the NBA in blocked shots. Serge Ibaka is unlike any player in the league. He can shoot, finish, run the floor, set screens, rebound, and block shots. His impossibly comprehensive skill portfolio would be rare for any player, but it’s especially remarkable considering his origins. As the Grantland Features documentary Son of the Congo beautifully illustrates, Ibaka was not coddled and nurtured in some blue-blood basketball incubator like Lexington or Tobacco Road. But here he is, both a trailblazing African player challenging our conceptions of basketball in the developing world and one of the most versatile big men on the planet. It wasn’t always this way, especially on offense, where Ibaka struggled in his first few years in the league. Yet, if the new film shows us anything, it’s that Ibaka is ascendant by nature, and his development on the floor is symptomatic of his determination to improve. Basketball growth is just one of the easiest parts to see and measure. I chronicled Ibaka’s development last year, but unsurprisingly he continues to get better; he adds things to his game every season. I spoke with him Tuesday about the latest addition to his skill set: a 3-point shot, a new tweak he says was motivated by recent losses in the NBA playoffs. Space has become a magic word in almost every contemporary offense, but it’s especially important to Oklahoma City, a team that — when healthy — features two of the world’s scariest attackers. Ibaka, who will be out three to six weeks while recovering from knee surgery, knows that his team is easier to beat when it gets bunched up and fails to spread the floor. Although Ibaka has dabbled with corner 3s for a few years, when you look at his common shot locations over the past two seasons, it’s clear that this season is the first time he has fully committed to his outside game, especially above the break. Last year, only 6 percent of Ibaka’s shots came from beyond the arc. This season, that number is up to 26 percent. Guys like Kevin Garnett, Nowitzki, and David West have made careers knocking down long 2s, but Garnett and West have never thrived beyond the arc. There was no evidence that Ibaka’s experiment would yield positive results. Unsurprisingly, given his work ethic, Ibaka’s 3-point shot has been pretty good right off the bat. He’s by no means Korver, but he’s already hitting his 3s at above league-average rates, which is something most shot-blockers can’t say. Looking at his shot chart from this year, a few things jump out. First of all, with a few minor exceptions, he’s pretty good from everywhere. Second, for the first time in his career, a majority of Ibaka’s shots are coming from beyond 16 feet. It’s a curious retreat for a player built to dominate the interior. But when you play alongside Russell Westbrook (and sometimes Kevin Durant), the best thing you can do is get out of the way, especially if you’re dragging an opposing rim protector with you. 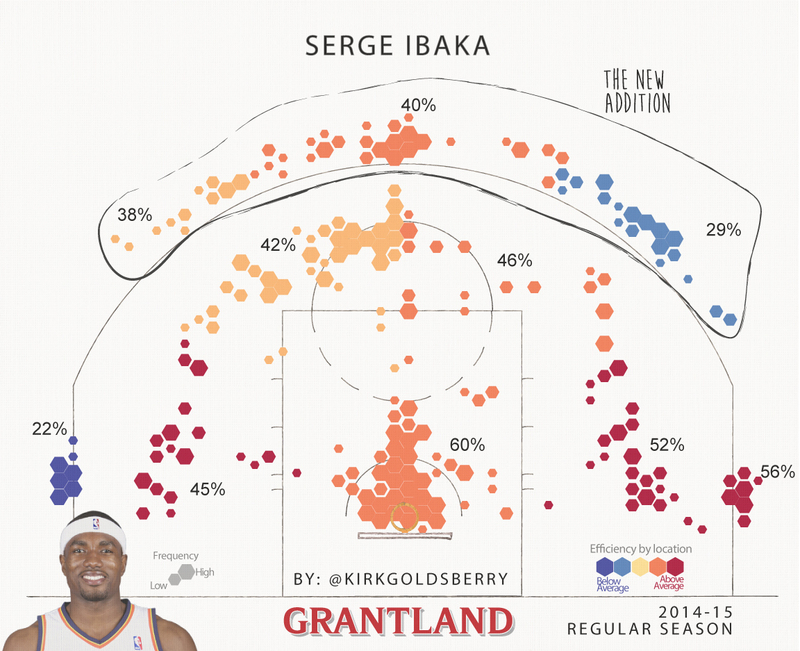 Thanks to his reliable jumper, Ibaka can both move away from the basket and still provide a scoring threat. Within Oklahoma City’s Westbrook-centric offense this season, Ibaka’s role has been to catch and shoot. Teammates have assisted on a vast majority — 296 of his 374 — of his made field goals, and 76 of his 77 made 3s. The Westbrook-to-Ibaka pairing is not only the most successful assister-shooter pairing in OKC this season, but it’s also the sixth most prolific assister-shooter duo in the NBA. When Oklahoma City is healthy, it can score in countless different ways, from countless different spots. Thanks to the all-universe talents of Westbrook and Durant and the spacing provided by Ibaka, the Thunder present defenses with a multiple-choice test that has no right answer. But they aren’t healthy, and this season has been an orthopedic nightmare for OKC’s big three. As Wednesday night’s game in San Antonio showed us, without Ibaka and Durant, the Thunder are still fun to watch, but much easier to defeat. They miss the space. Snyder Stays Silent: Why Washington’s Quiet Offseason Provides a Welcome Change in D.C.